Employing a research informed approach, Liz Thomas Associates Ltd works with you to improve student experience and outcomes in higher education and beyond. Academic advising and personal tutoring • Access • Equality • Financial support • Inclusive learning and teaching • Induction and transition • Institutional change • International perspectives • Monitoring and evaluation • Progression: access to postgraduate study and the labour market • Social mobility • Student engagement • Student retention and success • Student services • Widening access and participation. We offer a number of services such as keynote addresses and staff development workshops; research and evaluation; writing and publication; institutional development and change; and tailored consultancy. Our expertise and services can be combined to improve many aspects of the student experience and student outcomes. Professor Liz Thomas is an independent researcher and consultant for higher education and Professor of Higher Education at Edge Hill University. Commuter students have less good outcomes than students who move away to study. This includes a weaker sense of belonging; lower rates of continuation; fewer first class and 2.1 degrees; greater academic failure; and less likely to get a graduate job. Interviews with 60 commuter students from nine universities explored their experiences of student engagement in academic, enhancement and social activities, and university responses. The report from the What works? Student retention and success change programme is launched at a full-to-capacity conference in London. Download the full report and summary report here. 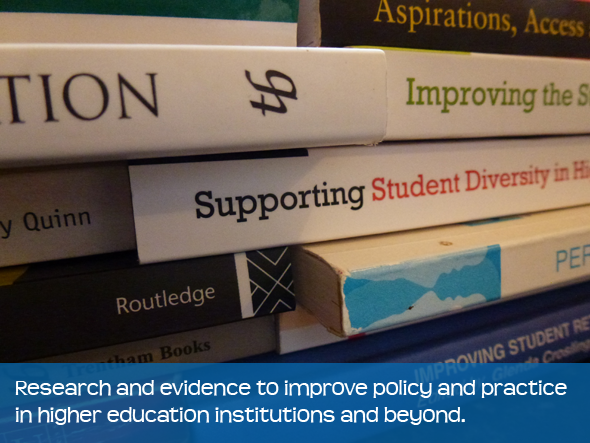 In the context of the Teaching Excellence Framework (TEF) improving student retention and success, particularly for students with particular characteristics and studying subjects with high rates of non-continuation, has never been more important.The two What works?programmes of research have contributed significantly to understanding about student retention, success and excellence. Prior to the What works?studies the most common approach was to ‘fix up students’ through bolt-on interventions to try to retain them. This was very ineffective as the students most in need of additional support were often the least likely to access it. Following the first phase of the What works?programme our understanding moved to the importance of facilitating students’ engagement and belonging in their academic learning as the most effective way to improve the success of all students. Building on this we can now understand that it takes a whole institution to work together to provide an excellent learning experience for all students and maximise their success in higher education and beyond. The report extends our knowledge about effective interventions, and contributes significantly to our understanding of the process of implementing change in a complex organisation – and provides a model to support institutions to plan and improve student experiences and outcomes. Professor Liz Thomas is working with CFE Research on two contracts awarded to them by the Higher Education Funding Council for England (HEFCE) to explore the impact of Student Opportunity Funding. University All-Party Parliamentary Group: ‘Crafting the class’ to ensure a balanced student body? On Tuesday 21 October 2014 Professor Liz Thomas addressed the University All-Party Parliamentary Group at the House of Commons. Professor Liz Thomas addressed the final conference of the E-quality: Linking quality and social inclusion in higher education in Croatia project at the University of Rijeka on 21 February 2015. Liz will be a keynote speaker at the conference The Social Dimension in European Higher Education, 25-27 February, University of Economics, Vienna. What works? Student retention and success change programme: Survey for discipline teams, summer 2014.